After the past few weeks of madness, I'm back with Fashion and Film Friday! This week is Coco Before Chanel starring the lovely, adorable and charming Audrey Tatou as Coco Chanel. I actually watched this one for the very first time about 2 months ago and really liked it! Coco Before Chanel follows the early life of Gabrielle "Coco" Chanel before she became a legend in fashion. From orphan to cabaret singer to seamstress Coco had a rough and lonely life until she met Etienne Balsan, a wealthy textile heir who showered her with affection and the means to do what she loves most: designing haute couture fashions. Set in the early 1900's, Coco Before Chanel is a fabulous study of fashions that pre-date most of the clothing on this blog. Seeing how Chanel's awkward, boyish style was viewed in her time really helps us to understand how and why Coco Chanel revolutionized women's fashion. I particularly love this scene where she is dancing in a classic black dress that she made and all of the women around her are wearing lace and pretty colors....but all eyes are on Coco! Even many years after her death, Chanel fashions are everywhere. With classic, elegant lines and colors, it's not hard to capture some of that Coco style! It's funny for me to read 'as long as you don't mind subtitles' because as a Dutch girl I'm so used to subtitles, I don't even think about it anymore. I saw the movie in the theater, and I liked the fashion, but the story was a bit to slow for me. 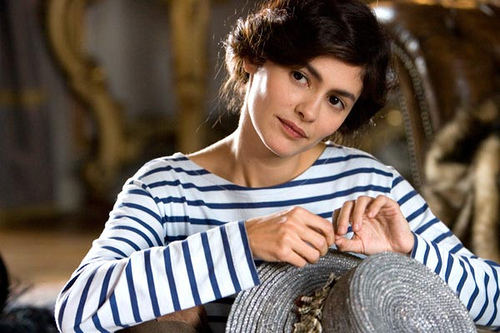 Though, Audrey Tautou is lovely as always. 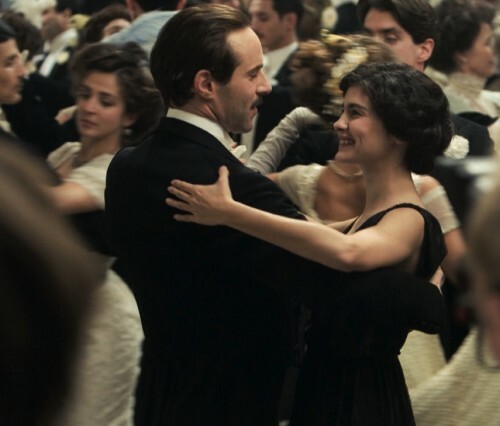 I thought the movie was a visual feast but I am a huge Audrey Tautou fan, so I love all her films. Thanks for posting the lovely clips from the film. Marloes- yeah, I'm from the US but I took 4 years of French and 2 years of Spanish in high school so I'm used to subtitles too. I do know a lot of Americans who say "I don't watch movies with subtitles!" too bad, they're missing out on a lot of great movies!! Speaking of Audrey Tatou and great movies, I saw Amelie for the very first time last week....oh, I'm in love! I made my husband watch it when me when he got home from work. He stayed up till 1am watching it! He loves it too!! I just put this on my Netflix queue the other day! Looking forward to seeing it even more now. Amelie is one of my all time favourite movies! By the way Brittany, email me at rach_mack @ hotmail.com with your address so I can send the 1940s day dress pattern to you! This was such a great movie and I love the accompanying fashion inspiration! I love this movie! The costumes were amazing. I remember I wanted to wear just menswear after watching it, lol. Chanel is still one of my favorite people! I have been wanting to watch this since it came out. I love chanel and Audrey Tatou. Although just recently read an article about chanel during WW2 that was very unflattering. Made me a little sad. Anastasia- oh, what a scandal that was! For those of you who may not know what we're talking about, apparently Coco Chanel had an affair with a high ranking Nazi official during the nazi occupation of Paris. At first, I thought that maybe she was naive but in reading further, I found that she took advantage of the law banning Jews to own businesses during the war and took over her perfume company, which was ran by a Jewish family...bad move, Coco! She was exiled to Switzerland for 15 years after that incident. Yes, Anastasia, that made me sad too! :( I don't know if you call that being a war profiteer or just a jerk but in any rate, that scandal has hurt her name since ww2 and has lost her many valuable customers! tsk, tsk!! I've seen a made for TV version of this but I love Audry Tatou so I am looking forward to seeing this more. Like Jennifer said, Amelie is one of my all time favorite films too. Coco Chanel is one of my favorite designers I.I liked fashion inspiration of this film when I saw it. Loved the movie, I just thought that Tatou was playing Coco a little too much like an Edith Piaf character. I am French so I did not need to read the subtitles, and some of the songs featured in the movie were sung by my grand mother at family occasions!! !